Some of the world's most popular vacation entertainments involve wild animals. Before people book their visits, though, they should stop and think. If you saw an elephant in the wild, would you leap on its back and expect it to calmly take you for a ride? And if you saw a tiger, the last thing you would do is wander up to it, hug it and take a selfie. Your life expectancy would be short. So if they wouldn't do it in the wild, how come they do it in captivity? The answer lies in the unseen suffering animals endure before tourists ever reach them. 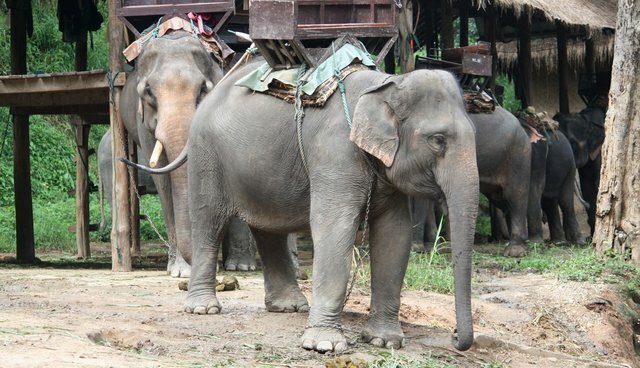 Young elephants, usually captured from the wild, are chained in tiny pens, unable even to turn around. Regular beatings break their spirit. Then the real work begins. Restrained by chains, isolated from other elephants, kept in bright sunlight on hot concrete that hurts his feet - until it's time to carry the next heavy load of excited tourists on his back, controlled by a bull hook if he puts a foot wrong. Such is the life of an elephant ‘working' in tourism entertainment in Asia today. On October 4, people around the globe marked World Animal Day - a day to celebrate our relationship with the animals that share our planet and make such a huge impact on our lives. This year, we're reaching out to animal lovers across the world to highlight to them the hidden suffering that goes on behind the scenes in wild animal entertainment. The bitter irony is that a new survey shows that around half of the people who go to ride elephants or hug tigers do so because they love animals. They are simply unaware of the suffering behind the scenes. But there is some hope. A huge majority of people, 85 percent, agree that wild animals belong in the wild, and a similar number would expect their tour operators to avoid shows that involved cruelty. And some tour operators have begun to listen. By highlighting the problem before people book their vacations, we hope to help people help those animals - by shifting the focus of tourism to more ethical tours. Instead of snatching animals from the wild, those who want to see them should carefully and ethically go to watch them in their natural habitats. There has already been one success story that saw the end of the practice of dancing bears in India. By working with local partners, World Animal Protection helped the Kalandar community that depended on bear dancing for their living to transition to different livelihoods. Life is now better for them and their animals. Tourists can help us achieve the same for lions, tigers, elephants, monkeys and their owners across the world. Animal-loving tourists are, more often than not, entirely oblivious to the pain suffered by the animal that appears to be so peaceful and content. They don't know that bull hooks have been used to pierce the elephant's thick skin during its long, arduous training. That the tigers lolling in their laps are cooped up in small cages when out of sight. That the lions walking calmly among them are likely to be drugged. Captive conditions, no matter how comfortable they appear to a human, can never meet a wild animal's needs. The scale of this problem is huge. Around a quarter of all elephants on the planet are held in captivity, and there are more tigers held captive in America alone than remain in the wild. This new campaign, by reaching out to people before they book vacations and by getting them to partner with us in alerting others to the hidden suffering behind tourist attractions, gives real hope to huge numbers of animals. We all have our part to play, so let's work together to keep wild animals where they belong – in the wild. Visit www.beforetheybook.org to see how you can get involved. Photo copyright of World Animal Protection.